While living in Phnom Penh I got to know this artist, Nic Grey. Came across his work in Java Arts during the last day of his first exhibition there. Was swept off my feet. He is soon opening an exhibition about the life of UG Krishnamurti – about which I am going to write next. But have a look at this older work that I picked up from the web here. During the 1980s, at a high-security mental hospital in Devon, England, a page-long story about a man called Joe Odd, was found. 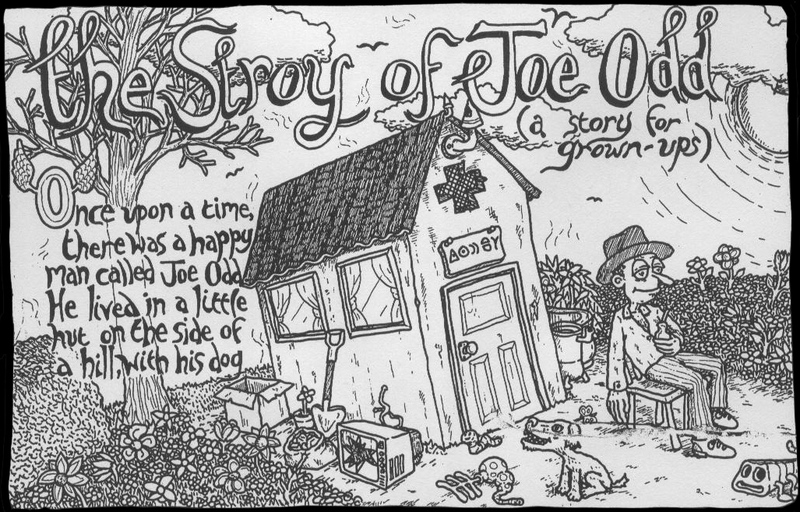 In the mid 80s the artist Nicolas C Grey got hold of this story and in 1991, the 3-page long Stroy of Joe Odd was created. The Stroy of Joe Odd is a surrealistic tale about norms, control and lunacy. The way Nic talks about his work appeals to me, because it conveys the essence of what good art is about: if I could express myself verbally, then I wouldn’t need to draw the pictures. I envy him. I write because I haven’t got any better way to express myself. If an image is to small for your liking, click on it and watch the drawings in slide show mode. This entry was posted in personal and tagged Joe Odd, Nic Grey. Bookmark the permalink. Excellent stroy and illustrations! Thanks for sharing it! Yes, Nic make fascinating stuff. Have bought two of his smaller pieces just before leaving Cambodia. Very much one of a kind.